Indian Vanity Case: Jiaoli ~ Miraculous Cream for Dark Spots & Melasma? Jiaoli ~ Miraculous Cream for Dark Spots & Melasma? Before you read any further, please be warned that this brand has stirred quite a lot of controversy and also banned in some Asian countries! I am not advising anybody to try it out. I just want to share what I know and read about it. According to the royal secret recipe, the product is made of Ginseng and other herbal extracts with outstanding effect, and can instantly penetrate deep into the skin, inhibit the formulation of melanin with special effect for removing chloasma, butterfly spots, brown spots, pregnant spots, UV spots and acne spots. Skin appears ruddy, soft and bright after use. The white cream, however, does not contain Mercury (according to what I read on the internet), which is why most people just use the white cream. But in extreme case of Melasma, people use the yellow cream for quick results. I, of all people understand what these people go through living with Melasma, because I have gone through the same myself. Does the yellow cream work? YES. 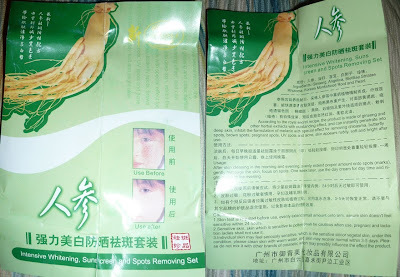 It did remove most of my cousin sister's butterfly spots on her nose and cheeks. That's is the reason I asked her to get this for me. Of course, she had no idea about the Mercury and all that before she used it, until I got my hands on these and did some research on the net. And yes, I've advised her to not use the yellow cream anymore. Some people just use the white cream. Who SHOULD NOT use these creams? Pregnant and lactating women. Will I use them on myself? YES. On my freckle-like dark sun/age spots and a bit of light Melasma on my forehead. But just the white one initially. I MIGHT use a bit of the yellow one too if the white one doesn't do anything, but only for 5-10 mins a day and wash it off. I'll say it again, please use your own judgement before trying anything I mention on this site. Please read the Reviews & Disclaimer in the About page. So, any of you heard about these or tried them? Do share if you have. Thank you for the reviews! I'm following you now. Looking forward to your future posts. it contains mercury? that's kind of bad, but then again eating fish more than 3 times per week will also give you a high level of mercury. Meh I dunno, everything will eventually kill you in the end I think! Hey CZ thanks much!! It's definitely gonna help a lot of people who are planning to buy and use it. I have never seen anything like this here. The white cream actually seems good. As for the ingredients, at least with this one you know what's in it and you can decide. Goodness knows what goes into some of the creams available in our shops..is either no ingredient list or they just list a few of the ingredients - like we are going to make it ourself if we know the magic recipe! @Pop C ~ LOL XD Ur too funny!!! Very interesting product, thanks for sharing it with us Cynthia! I did a lot of researching on skin lightening products. Yes, using mercury based creams is not a good idea, if it gets absorbed into the blood stream, the outcome won't be pretty. Never heard this brand before..But lots of chinese cosmetics were banned here because of their high level of mercury and hydroquinone.Lots of people here are"affraid"of anycosmetic that came from mainland china.Me too.. There is a lot in Cambodia! this cream really incredible...the price really cheap but the result really good and better than other expensive cream....i swear,after deliver my first baby.. my face really in very bad condition..so many pimple and blackhad... i try so many product before ..
until i find this product..now i only used this product..
after that...only used the white..the yellow u can stop used. I am not remotely interested in this but my mom's on my case to find out more about this cream (she currently uses Ruiqian). I see that you mentioned the price but do you know where we can get this cream? Do we get it in Dimapur? If so, any pointers to stores would be highly appreciated it. I myself live in Bangalore but I doubt I'd have much luck here. I know it's a very old post but any information would be welcomed. Hi Timmy, I got this from Shillong, so u might get it in Dimapur too. If u know anyone in Shillong, the person can ask around in beauty parlours. Hope that helps u a little. Thanks for the quick reply and thanks for the information as well! I'm afraid I don't really know anybody in Shillong but I do have some contacts in Dimapur. I guess I'll ask around there. 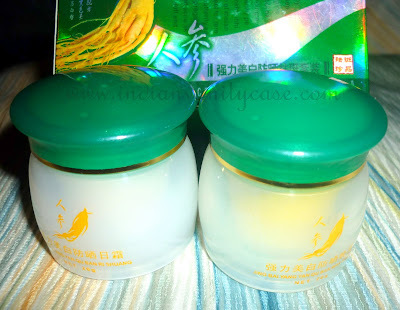 Today I bought one set Jiaoli for myseself, basically I want to use this products for my freckle on my cheek. Is it work for removing my freckle from my cheek.Please can you tell me. Give me a suggesstion on "rashedrahman@ymail.com"
I am from the Philippines and a friend suggested me to use S Zitang Cream, it is the potent version of Jiaoli, after two months, my skin is softer like a baby...sad to say, most chinese beauty products were banned here in the Philippines but few stores are secretly selling it...but it really works, just sometimes Im thinking of that mercury issue so I stop it this month and use amira magic cream...which is very expensive. which one is the day cream the white one? Hi, I have been researching this for cream for a while now. Surprisingly, all the talk about mercury seems hearsay. I couldn't find one lady who actually used it and had side effects. Although there were lots who did see amazing results. I ordered online. Received the package yesterday. Have used soap and both the creams. Will let you know the progress. Ladies, I am back with an update. I used this for almost a week now. And believe me when I say this, this cream works like a charm!!! I can see almost fifty percent improvement in just a week. One word of caution though, this is not meant for women with super sensitive skin. I have normal/dry skin and I have never had breakouts/pimples in my entire life. With this cream, there was some burning sensation in first few days though. My skin felt dry and flaky with it. However, by fifth day, the flakiness was gone, there was no burning sensation and I had soft smooth and pink skin. I am continuing to use it and will be shipping the other box to my mum as well. We both spent tons of money on expensive creams for pigmentation and this is the product that we are sticking with. So glad to hear it works for you! :) I also experienced drying & flaking during the few times I used it. white is the day cream and yellow one is the night cream. fro where will i get in india punjab? when i try from alibaba online shopping, the cost is very high. I used jaoli the blue one 10 days elimanating cream but 15days na ako gumagamit but nothing happen walang nag bago sa face ko sa 168 mall ako bumili sa divi. Hi can I use this product even though I have pimples? yes ! u can use it. C'mon guys!There is no safe in this world.. atleast I die happy.. I used this product too . It works on me..
there is no safe in this world! Atleast I die happy.. I used this product too.. and it really works on my freckles..
Hi I wonder how long do u have to have the cream on? Both the day and night cream? 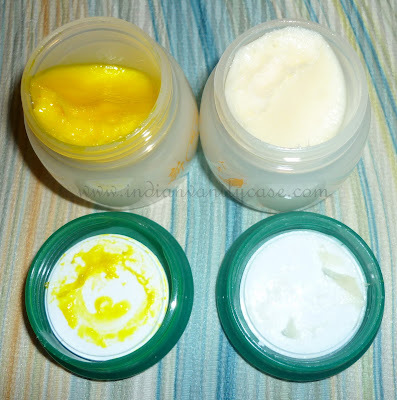 The yellow cream is so effective on my face it lessen my dark spots effect by my acne problem.If you want to use this cream I recommend that you stop using it after you saw the effectiveness in your skin after 1 or 2 weeks and find another way or solution that will replace in your yellow cream. Just change the yellow cream as soon as possible for you not to worry about the mercury content.Godbless! I am so stress in Finding a product that will help my skin from acne, acne scars, freckles etc., I bought and tried more expensive products from the market but still not work for me...until I saw this product in one of the beauty store here in Oman, so I decided to try it, it's very cheap thou,but I am so disperate to clear up my face from these disgusting acne. In every product I tried, I gave it a try for a week or two, and I've noticed from my 2 days of using this product, my big acne flattened and my scars slightly lightened up.., so I continued it 'til a week, and all pimples are gone,but my scars are still there maybe it takes time 'cause it so deep..but I will rest for 2 days before I use it again...be careful to buy jiaoli cream, because fake products are everywhere...and always use green tea as toner with rose water, it refreshes your skin and unclogged your pores..and store your jiaoli cream at refrigerator ,apply gently on your face much better in potting motion and dont use powder or make up foundation when you applied the morning cream, use sunblock instead and if severe redness and rashes appears on your face discontinue it..I will update you guys when my scars are all gone. Haha... i just bought it for 70rs in imphal, manipur. I do have light pigmentation. Wil try n update. I used Jiaoli cream when I was in college, 8 years ago. It is the only cream that helped me on my acne problem. But due to its mercury content according to FDA, it became banned here in the Philippines so I stopped purchasing it. No creams or any beauty products worked on my face so I was very sad and frustrated they banned it. Late last year acne strucked me again, with cystic pimples and worst skin ever. 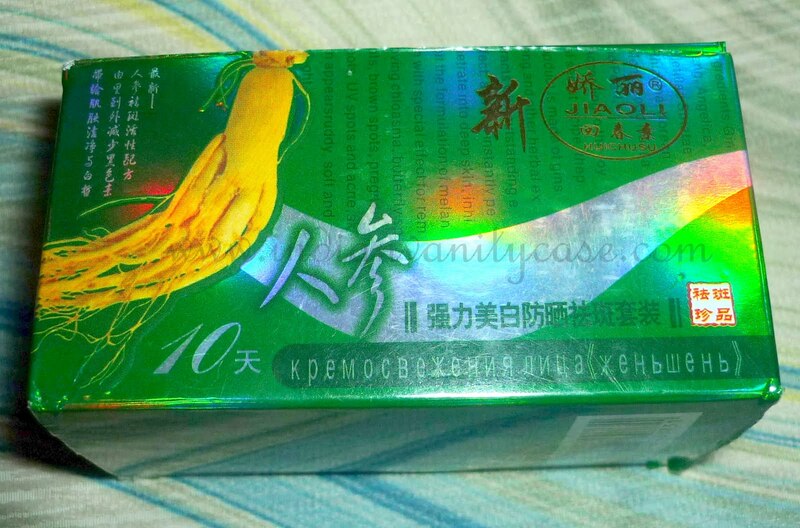 So i was so desperate looking for Jiaoli again online because it is the only one that can do miracle to my skin. Luckily, I found a seller on the internet but sell it on an expensive price from 150 pesos it became 500. Because I was desperate I bought it. I'm on my first week now. And I'm so happy because my skin has an improvement, my acne are almost gone. And no pimples are showing up again. This is really a miracle cream ever invented. Hi I have been using this for at least 5 years, and I love it. I have tried all kinds of super expensive treatments with the dermatologist and laser and aesthetic clinic and NOTHING has helped me get rid, not completely but enough that I am not self conscious about going without makeup. I just want to know where I can get it online since the place I buy from here locally charges me $60 dollars, they do include a soap and another cream (supposedly)sunblock. Dp you think it will help to remove melasma? ?